Today’s the day. The secrets out. Announcing the Simply Charmed Blog Hop. Isn’t Valentines Day great. A day focused on telling those we love just how much they mean to us. Fabulous. And what better way to show someone you care than to give them something special made by you just for them. So that is why Melissa from Happy Quilting asked some of her amazing friends (and me) from blog land to join her in bringing you the Simply Charmed Blog Hop. 10 days of Valentine tutorials and giveaways kicking off on February 1st. So here are the amazingly talanted ladies that will be joining me. The Simply Charmed title came about because each of us created our project using 1 Charm Pack and added yardage if necessary but only for backing, lining ect. 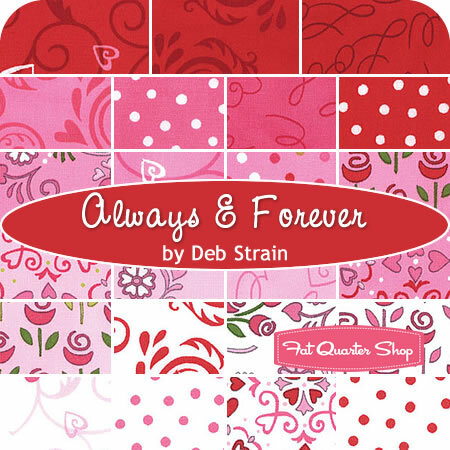 The bulk of each project is made using just the 1 Charm Pack of Always and Forever by Deb Strain. And trust me, you are going to be amazed with what you can create using a single charm pack!!! And what fun would a Blog Hop be without Giveaways??? 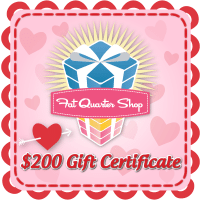 Fat Quarter Shop has graciously sponsored the fabric used in making the tutorials. So are you ready to hop along with us? Are you excited for February 1st? Well then grab a button and spread the word. Let’s see how far we can spread the homemade love this Valentines Day. perfect! i have my eye out for charm square baby quilt ideas–I'm sure I will see something with all the talent you've got lined up! This sounds like fun. I just bought this charm pack a few days ago. I know what I am going to make with it.